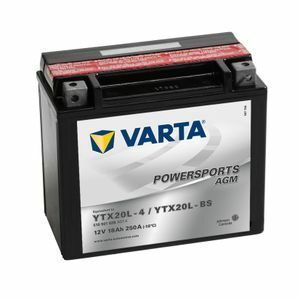 All you could want from a battery, good value and works a dream. Mega happy with the battery and the tayna. Unfortuantly had nothing but hassle with yodel delivery. Ordering this item was a pleasure, website easy to navigate, item arrived on time and was exactly what i wanted. Very impressed and would use again for sure. Battery being replaced was of American origina, and labelling unclear, but the numbers and dimensions given to TAYNA enabled the correct battery to be selected and duly sent. I spent few minutes reading the multi-language directions (in English) and installed the bettery. On first press of the starter button, a healthy engine roared into life, and all accessories functioned as intended. Quick delivery, good price. Battery works well. not the highest amp hour the size but quite adequate for summer starting. Delivery excellent, easy to fill and volts in spec after 30 minutes standing. Charged over night to be sure. The OEM lasted 5 years cost twice as much so looking for 3 years plus to break even. good service,didnt have what I ordered but sent better one at no extra charge.